Mary Magdalene Wins 2012 Golden Halo! Congratulations to 2012 Golden Halo Winner — Mary Magdalene! according to the Supreme Executive Committee. Early on the first day of the week, while it was still dark, Mary Magdalene came to the tomb and saw that the stone had been removed from the tomb. But Mary stood weeping outside the tomb. As she wept, she bent over to look into the tomb; and she saw two angels in white, sitting where the body of Jesus had been lying, one at the head and the other at the feet. They said to her, ‘Woman, why are you weeping?’ She said to them, ‘They have taken away my Lord, and I do not know where they have laid him. Plus, I was worried that Emma might win the Golden Halo once all of Hawaii cast their votes.’ When she had said this, she turned round and saw Jesus standing there, but she did not know that it was Jesus. Jesus said to her, ‘Woman, why are you weeping?’ Supposing him to be the gardener, she said to him, ‘Sir, if you have voted for Emma please tell me and I will go away.’ Jesus said to her, ‘Mary! You have won the 2012 Golden Halo!’ She turned and said to him in Hebrew, ‘Rabbouni!’ (which means Holy Toledo!). Jesus said to her, ‘Do not hold on to me, because I have not yet decided upon the bracket for Lent Madness 2013. But log onto www.lentmadness.org and encourage my disciples to buy a commemorative mug.’ Say to them, “I am ascending to my Father and your Father, to my SEC and your SEC (to straighten out those two goofy priests).”’ Mary Magdalene went and announced to the disciples, ‘I have seen the Lord.’ And then she told them she had won the Golden Halo. They were amazed, but Thomas cast his eyes downward, for he remembered his poor performance in the first round . The “Gospel” of the Supreme Executive Committee. 94 Comments to "Mary Magdalene Wins 2012 Golden Halo!" congrats MM, and to all who made Lent Madness the awesome thing that it was. Looking forward to 2012!! This has been the best time (and of course, the most informative) I have ever had during Lent! Thank you!! Can’t wait to get more of Atlanta involved in 2013! You guys and all the saints rock! Congrats, Mary!!! My priest at St. Bart’s Atlanta referred to Lent Madness in a sermon early in Lent, and I’ve been voting ever since. I love this competition! I don’t know how I’m going to cope with LM withdrawal. Thanks so much for all the great efforts put into it. It’s been quite an education! Congrats MM! Wear that Golden Halo proudly, as you definitely earned it with your love and devotion to Jesus. Thanks to all who made Lenten Madness so enjoyable! I especially loved this final installment! Can I shout you all this shout out a couple days early? The Lord has risen indeed! Thanks be to God! Happy Easter to you all! Thanks for an informative and fun Lent Madness. Hope to see something interesting for our next Liturgical Season. Keep up the fun. This was all delightful. Thanks to Supreme Executive Committee, Celebrity Bloggers, fellow voters/ commenters and congratulations to Mary Magdalene. That Golden Halo surely looks great on you! Thanks for an informative and fun Lent Madness. I can’t wait to see next year’s bracket. Thanks to all who made Lent Madness fun, informative, and yes, spiritual! Your hard work made Lent pass by quickly, even without FB for me! So glad Mary won the halo ….. Now, on to Maunday Thursday footwashing and then tomorrow, the Cross… Definately, one of my more prayerful Lenten disciplines.Those who didn’t participate missed on many, many, fronts. Have a Holy Easter. See you in 2013 … So is it back to Forwbard Day by Day now!! Talk about withdrawal! I believe that “Rabboni” would be Aramaic, which was the language spoken by Jesus contemporaries. Hebrew was the language of formal prayer and holy texts, no longer the spoken language of Jews in the Holy Land. Correction: that should read, “… the language spoken by Jesus and his contemporaries.” Sorry! Angela, if that’s the only problem with this “gospel” I think an intervention may be necessary. Thanks to the SEC and the Communion of Saints – in heaven and on the internet – for a delightful Lenten tournament! Huzzah for Mary! For the first time in the history of the church, Mary FINALLY receives all the adulation that she so richly deserves. I’m guessing that this is exactly how it felt when the canon was finally set by the gathered leadership of the church… It is a monumental day! Mazel tov, St. Mary of Magdala! Well done! Would anyone believe I’m at a (temporary) loss for words? Thank you is insufficient to express my gratitude for being able to participate in Lent Madness this year. I am shocked by the gross scholarly oversight of the SEC. If the text is viewed carefully, and in context, it will be immediately clear that Toledo is a later interpolation or scribal gloss. Toledo as a city had not yet been founded! The NKJB (New King James Bracket) states the response as “Holy Moly!” One must be careful before jettisoning tradition! Over the top!! It will be a challenge to surpass this for next year, but knowing you two guys, I’m sure you will come up with something. Thanks for the Lenten fun, and info. This made my morning! I can’t wait to see what 2013 will bring! As two the two “church leaders” who brought this to us all, thank you! Does this mean that you are again going to be archnemesises (sp?). I am hoping that this lesson in cooperation has brought about a true and deeply felt bond of brotherly love. Perhaps you can find other archnemesises who can also, later, be brought into the circle of whatever you two have. I’d suggest a girl. Throughly enjoyed this and looking forward to next year! Love today’s post. thank you! for great fun & learning. A blessed Tridium to all! Wonderful portrait of Magdalene. Mary looks uncomfortable with her newly earned halo… as only a true Saint would~! What a Pythonesque take on the Gospel! Just the right touch! Thanks to all — to the SEC, the celebrity bloggers, the Bracket C(T)zar, and all those who made comments. I learned so much and had so much fun! Wishing a solemn Triduum and glorious Easter to all. Claire, while I too love tradition and agree that it should not TOO easily be cast aside, some scholars (or at least ONE scholar, though I use that latter term rather loosely) recognize the possibility that Mary was acquainted with the Toledo region of Spain, south of Madrid which, according the the infallible source, “Wikipedia,” has been settled since the Bronze Age. Thus, there may be legitimate debate over whether the proper translation of Mary’s exclamation is REALLY “Holy Toledo” or “Holy Moly” as you suggest. I mean, she didn’t SPECIFY Toledo, Ohio! I.e., it may not have been “scribal gloss” at all!!! Again, though, thanks to the SEC, CB’s and all participants! And, Tim, if the SEC DOES begin performing interventions, just let me know and I will surrender myself peacefully. Grr I wish Joan of Arc won, but Mary was my second choice. I just really love the story of Joan of Arc. Bless you – Joanie on the pony is my home town (Chinon, France) girl and I too am faithful to her! Congrats to MM! Heaven’s sports bars are filled with celebration! She fought the good fight and well deserves her Golden Halo! Thank you both, Tim and Scott, for bringing light and learning to Lent. May you and yours have a most joyous and blessed Easter. I can’t wait for next year’s brackets. “Heaven’s sports bars are filled with celebration!” I have loved all of this Lent Madness, but that is the best quote of all! Thanks. This is why I’m an Episcopalian. Well, as a first time participant in Lent Madness, I must say its been fun, although at times irreverant. As I commented earlier, I was a little disappointed that it turned out to be a popularity contest rather than a serious look at the spiritual virtues of the contestants. Oh well, life is full of disappointments (ask Deitrick Bonhoffer); the blogs were entertaining and our Supreme Council seemed to enjoy themselves enormously. I do admit to getting too serious about something that is really just entertainnment (like politics?!?). I look forward to next year! I didn’t see it so much as a popularity context, as a demonstration that different saints resonate with different people. All of the women and the men had virtues… and really how do you compare differing virtues ? In the middle ages, there were many local saints, and their veneration was an integral part of medieval society (as well as an economic boon). Readers of the Brother Cadfael mysteries will remember the importance of St Winifrid to the town where she was born and buried. I like to think of this year’s Lent Madness vis-a-vis Enmegabowh and Emma and Philander Chase as a return to that idea. There are of course and always have been “universal” saints, but people love their local saints with a different kind of love.
. . . and we can only hope that St. Winifred is chosen for Lent Madness one year! It IS (was!) Lent “Madness”, not “Lent Seriousness”. Lots of opportunity for the latter other places. Seriously (for a moment), there were people I didn’t invite here because I was concerned this exercise would just make them angry (wrong kind of “Madness”!). And people I did, because I hoped they’d enjoy it as much as I did. Thanks to the SEC and all the celebrity bloggers / participants. It was fun and a wonderful learning event. I am looking forward to next year. Congrats to St. Mary Mag – she rocks! I now leave my house in thanks that Mary Mags has won the GOLDEN HALO fair and square and as I serve as Deacon at the Bishop’s Chrism Mass, I will try with all my might and main not to skip in procession, especially since I have poor balance and am wont to trip over a cobblestone or two….OH ! Who gives a holy fig…MARY MAGS has done it ! And I love the SEC version of her appearance at the tomb, knowing full well that my two Padres have been consigned to hell for blasphemy. You go Padres…we’ll just have to pray for humorless folk, a/k/a sore losers. Thanks for a glorious LENT MADNESS !!! I want to add my thanks to everyone who’s been with us for this Lent Madness. It’s been great fun for me (well, except for having my saints get clobbered a lot). I’ve enjoyed getting to know the commenters. I’m even more impressed with Tim and Scott’s ingenuity and enthusiasm. Best of all, my fellow celebrity bloggers are so creative and are just totally awesome. Hurrah for Mary Magdalene! She was my pick from the beginning! About that commemorative mug? I already bought the Lent Madness 2012 mug! I want a mug with the winner on it! Possible? Hurrah! Now on to the Easter Tridium. Can I pre-order my Lent 2013 mug so that it arrives in Australia for Ash Wednesday?? I must confess that I thought Bonhoeffer would win… then I realized that no matter who I voted for, I didn’t really object to whomever eventually won. I’m a TEXAN (EVERYONE KNOWS WHAT THAT MEANS!) and understand how local pride trumps many things… but surprised even myself that when it came time to vote for Mary vs. Emma, the Hawaiians had me convinced that Emma deserved to be in the final contest…and my finger, no longer under my control, despite my desire to vote for Mary Magdalene, knowing she would probably win, pressed the Emma button in fellowship with Hawaii, so long an underdog state, yet a strong Anglican one. Not everyone who voted for Emma lived on the island! You rock, Hawaii! Those of us following LentMadness now know a true Hawaiian saint! Would we, had it not been for LentMadness? Heck no — I know I wouldn’t have encountered her otherwise — and I am surely glad to have made her aquaintance! All good things come to an end. Thanks for the fun. This has been educational, fun, and thought provoking. 🙂 it’s been great exploring my connections to the saints and to my fellow Believers. 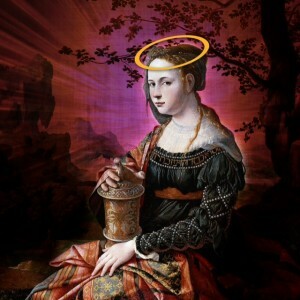 I’m putting in my early 2013 bids for Catherine of Alexandria (mythical? Never! ), Hildegard of Bingen, and Kassiani. And I love the idea of someone creating original artwork (or finding public domain artwork) for Mags on a Golden Halo mug… Next best thing to that Lent Madness tattoo. Ooh yes, Kassiani! I found out about her through Lent Madness links too, and she wasn’t even on the bracket. I plan to deal with Lent Madness Withdrawal by crocheting a kitschie little Mary Magdalene figure with her Golden Halo. Thus I am relieved that she won because it will be easier to adapt my pattern to Mary than to Emma. (I was seriously worried about Bonhoeffer). Many thanks to all who participated, and especially the SEC & CB! And the comments kept me returning to the site to read more. Thank you all. See you next time in this virtual mad world! Oh, please provide a photo when you are finished! I knew you would win Mary, because I have that little feather that floated down from the ceiling of La Sainte Baume, your Holy shrine in France. Thanks for a delightful Lent. “Oh, wonderful, wonderful, and most wonderful, wonderful, and yet again wonderful, and after that, out of all hooping!”* “Ma halo,” indeed (but I’m sure Mary is too humble to gloat)! Huzzah for Mary Magdalene! My husband and I have thoroughly enjoyed all this madness, only regretting that we had but one computer and therefore but one vote between us each day. We’re looking forward to next year already! *W. Shakespeare, “As You Like It” somewhere in Act I, I think. Clever of Will to have come up with a basketball term usable in this context, don’t you think? thanks to the SEC and all of the great bloggers. A good job well done, plus lots of laughing. Thanks for finally translating “Rabbouni” in a way I can understand. My bracket is pretty much in shambles and although the final scores have not been posted I know that I did not finish in first place. However with Lent Madness I learned some things and had fun doing it so that counts as a win in my book. To the SECc I can only say well done good and faithful servants, or however that phrase is supposed to go. Next week would be a good time for you two to start planning that fact finding junket to Hawaii that you have talked about. I have learned so much as I voted. I am still amazed that Emma beat out Bonhoeffer. I’m looking forward to meeting new saints in the 2013 brackets. My thanks goes to all! So happy about the result this morning! This has been the best Lent ever. I can’t wait for 2013. Thanks to all involved, and a Happy and Holy Easter. This good humored, yet serious competition helped me with Lent this year. I learned a lot and got to laugh. What could be better! Thank you Tim and Scott, this has been a blast as always! What would Lent be without Madness?! What an exceptional time this has been. I am only sad to see it end. I am not going to read the comments for today in fear that you guys are taking a bath for a hilarious bit of writing. My only disapointement has been people’s need to criticize you for trying to have a little fun. Why is it that people think we are allowed to have every emotion in our lives of faith except fun? Weeping good, laughing bad seems to be the mantra. Thank you so much for educating and enriching the the season of lent for my congregation and me. Next year I am printing brackets and handing them out on the Sunday before the games begin! Hurrah for Mary Magdalene and I look forward to next year. This was such fun. A spur of the moment, what the h*** is that all about, click to the link in the Episcopal News (Diocese of Los Angeles weekly e-news) and I was hooked on LM! What a fun way to learn about the saints and my church. Have thoroughly enjoyed my lenten journey (pilgrimmage?) this year. Glad that MM won, sorry that it is over. Next year awaits! Thank you so much. I had a lot of fun. Looking forward to next year. You guys are awesome. God Bless you and your ministry! Thanks to Tim and Scott for inviting me to be a part of Lent Madness. What an honor to shepherd “my” four saints. That Emma made it to the final round was especially thrilling! (Though it was quite a week last week with three saint write-ups, my kitchen being ripped out, and waiting for nine college decisions for our twin sons. Sheesh!) I’ve learned so much from all the offerings from my fellow celebrity bloggers. I am dazzled by their gifts and good humor, and the comments I enjoyed to no end. I would have liked to have shared more about Emma’s deep love for all creation and her care for native species, as well as her adventurousness as a horsewoman and one who hiked across the remote and wild places on the islands. Some of hundreds of Mele (or chants) dedicated to her – and written by her – are elegant and beautiful. The description in one biography of the last hours of young Prince Albert is incredibly heart-wrenching. Then there was that time when St. Augustine gave Monnica the slip by telling her the wrong time of departure as he, his lady friend, and their son, and sailed off to Rome. Little did he know who he was up against. Thanks to all for such good companionship over these last weeks. May Easter blessings abound! When I began participating in Lent Madness, I had no idea of the outcome. I thoroughly enjoyed myself in learning about the great people in our spiritual history. I have to say this has been a most fun Lenten season for me. My success was I took up walking every other day. I was not as consistent as I would have liked to have been but in the month of March I walked 6 hours and 43 minutes. Yea, for me. Thank you for your sharing your Lenten season with me. If for any reason Mary Magdalene is not able to complete her year, does Emma, as 1st runner up get the golden halo? Seriously though (or as serious as one can be in Lent Madness) this was so great! Enmegahbowh and Iron Sky Woman, Philander Chase, and especially Emma of Hawaii – what a great bunch of saints! I have a picture of the crocheted Mary Mag wearing her Lent Madness Golden Halo. I would like to upload it but don’t know how to do that (copy/paste to this comment box did not work). Is this possible? Can you tell me what to do? Could you post it on Lent Madness’s Facebook page? Or e-mail it to Scott or Tim and one of them could post it? This was great! Thank-you all so much. Peace and Blessings! Carol, try uploading the photo as an attachment to an e-mail to the SEC, and then they can post it for all to see! I admire your talent and your speed in completing the project today. Lent Madness has been so much fun for me! I’m very glad to have discovered it via the Forward Movement website. Kudos, Tim, for your creativity in inventing Lent Madness in the first place. Kudos, Scott, for your foresight in linking LM and FM so that we cyber-Episcopalians would find it easily. Kudos, celebrity bloggers, for your research, writing and participation in the fun. I, too, think that a 2012 LM mug with Mary Magdalene on it would be a big seller! Won’t the SEC now need to issue a press release explaining how Mary M’s reputation has been restored? Thanks to the SEC and everyone who helped put on LM! Thanks to all who made LM possible! I hope the thoughts about the things of Lent will be projected into the rest of the church life for 2012. I am challenged by the new aspects of my Christian year. I have found new directions to help and to be helped in my Christian faith, and I can find some less serious ways to bring some Christian learning to all. Thanks for the fun, but where did the figure of 50,000 participants in the ENS blog today come from? (Just hijinks?) Best I can figure about 3,000 participants. I was rooting for Mary Magdalene from the beginning, but am amazed she won over Emma last night. The 1,000 extra folks came out but seemed to split their votes. So happy that ” my Mary ” won. As her name means, she has been my tower of strength and has been there for me in my most trying times! I am so happy! This was a great way to celebrate Lent! Thanks Scott and Tim! Happy Easter to you both. Two great finalists. In the end, the best woman won the moment. Congratulations to my patroness Mary Magdalene! Many many thank yous to everyone who made Lent Madness possible. I have learned so much and it has all been so much fun. One small question, how do I get through Madness withdrawal? I, for one, will be drowning my sorrows/toasting the Lent Madmen and Madwomen/enjoying some Joe (and wondering if he will be in next year’s brackets)/and savoring this remarkable experience with my soon-to-be-arriving Lent Madness coffee mug. Okay, it’s pretty late in the game to pony up for the cup, but (a)that’s how I roll, (b) I want to support this ministry, and (c) my Rosie the Riveter “We Can Do It!” mug perished this week in a tragic dishwashing accident and I can’t think of a more inspiring replacement. Thanks so much for this game – you folks are great! PS. – I don’t think I could get through a week, much less a year, without my Forward Day By Day. Thank you to all who made and will make this what it is and will be in the future. My 13 year old son was really into this and it gave him something to talk about at church to others. Quite a fun way to learn about all the saints. New things about those you know and finding out about ones you didn’t! Next time I visit my dear friends in Hingham, I’ll be sure to worship at St. John’s. Thank you for Lent Madness! WOW! Congrats to MM . As a first timer in this “Maddness” it has been my best Lent ever! I am looking forward to the 2013 bracket… are we going to get T shirts? as well as mugs? Thanks again for all the fun and new learnings! 1 Trackback to "Mary Magdalene Wins 2012 Golden Halo!"